The beginning of a new school year looks different each year. It can include moving into a new dorm room, wayfinding through campus or scoping out the best spots for future study sessions. 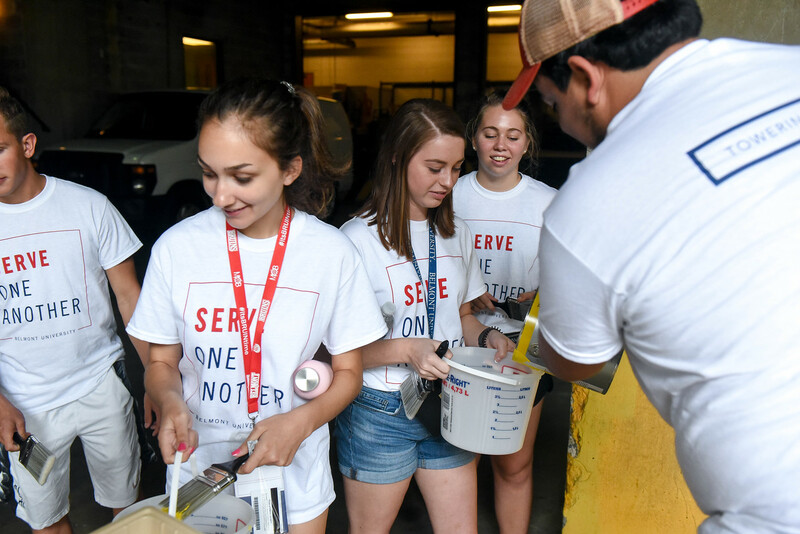 For more than 2,000 Belmont University freshmen and transfer students, this year’s new school year included all these things and a special opportunity to serve their community. In the days leading up to the start of classes, Belmont freshman and transfer students are immersed into university life through the Towering Traditions orientation program including an afternoon traveling to 26 locations across the greater Nashville area for service. The event, called SERVE, allows students to immerse themselves in their new hometown. After a send-off from University President Dr. Bob Fisher, Nashville’s Mayor David Briley was welcomed to the stage to inspire students as they went off into the community to complete various service projects. Loaded on buses, students visited Nashville General Hospital at Meharry, Sweet Sleep at Nashville First Baptist Church and Rise Against Hunger, among others, and spent the afternoon painting buildings and sidewalks, cleaning up outdoor areas and building beds. Service is a key part of Belmont’s values and is why SERVE continues to be an integral part of students first experiences on campus. Throughout their time across the city, students were encouraged to be engage with each other and understand the impact this one afternoon has on Nashville’s community. SERVE doesn’t just stop at Belmont’s newest undergraduate students, new graduate students also take part in the day of service. Belmont University’s graduate nursing students spent their afternoon at Project C.U.R.E completing a variety of tasks. Project C.U.R.E. sends medical supplies around the world to communities in need. Belmont graduate students worked hard to break down 26 pallets of medical supplies, pack and label $27,500 worth of infusion products and pack equipment for ultrasound machines and fetal monitors, among a variety of other tasks. Graduate students were also able to hear from a Project C.U.R.E. needs assessment representative to understand how their work would affect different communities. Included in the graduate SERVE participation was first year physical therapy students. The 49 students and two faculty spent the day at Feed the Children where they helped pack boxes of food for people in need in the area. “This was a great opportunity for the students to get to know one another on their first day at Belmont and to be able start their time at Belmont with serving their new community,” said Physical Therapy Department Chair Dr. Renee Brown.